Have you ever seen an original copy of Shakespeare’s First Folio? Well, soon you can when it visits Southern California. The Folger Shakespeare Library, in partnership with Cincinnati Museum Center and the American Library Association, is touring a First Folio of Shakespeare in 2016 to all 50 states, Washington, DC, and Puerto Rico. Here in California, The Old Globe and its partner, the San Diego Public Library, have been chosen to host First Folio! The Book that Gave Us Shakespeare, a national traveling exhibition of the Shakespeare First Folio. 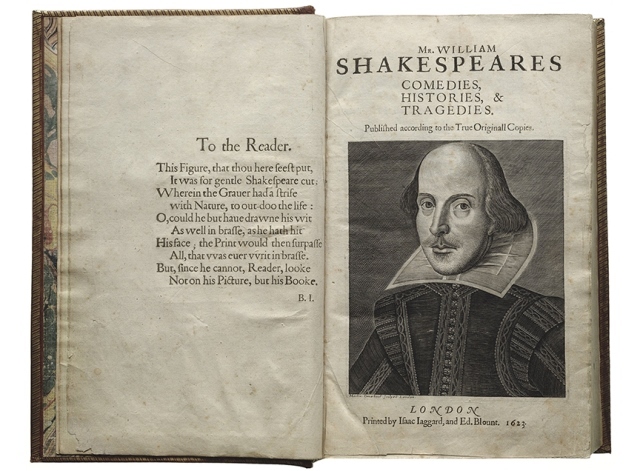 It is one of the most valuable printed books in the world; a First Folio sold for $6.2 million in 2001 at Christie’s and another one for $5.2 million in 2006 in London. It originally sold for one British pound (20 shillings)—about $200 today. The First Folio is the first collected edition of Shakespeare’s plays published in 1623, seven years after Shakespeare’s death. It contains 36 plays, half of which had not been published during Shakespeare’s lifetime and would have been lost if two of Shakespeare’s fellow actors hadn’t compiled the volume, hoping to preserve their friend’s work for future generations. The Folger Shakespeare Library holds 82 copies of the First Folio, by far the largest collection in the world and more than a third of the 233 known copies in the world today. It is believed that 750 copies were originally printed. When the First Folio arrives in San Diego, California, its pages will be opened to the most quoted line from Shakespeare and one of the most quoted lines in the world, “To be or not to be,” from Hamlet. Accompanying the rare book will be a multi-panel exhibition exploring the significance of Shakespeare, then and now, with additional digital content and interactive activities. The exhibition will be presented to San Diego by The Old Globe and the volume will be hosted at The Central Library @ Joan Λ Irwin Jacobs Common. Prior to, during, and after the exhibition, The Old Globe, the San Diego Public Library, and their many project partners will offer numerous public programs for adults and families. Touring dates for First Folio! The Book that Gave Us Shakespeare will be announced in April 2015. You can bet this means a road trip! First Folio! The Book that Gave Us Shakespeare has been made possible in part by a major grant from the National Endowment for the Humanities: Exploring the human endeavor, and by the generous support of Vinton and Sigrid Cerf and the Google Inc. Charitable Giving Fund of Tides Foundation. Sponsorship opportunities of this major exhibition and the Folger’s other Wonder of Will programs commemorating the 400th anniversary of Shakespeare’s death are available; learn more at www.folger.edu. For more information about The Old Globe, visit www.theoldglobe.org. For additional resources, or to search for materials in the Library’s online catalog, go to www.sandiegolibrary.org.